Click Here to Visit BBC America Shop's Doctor Who close-up to find out more about the longest-running science-fiction television series of all time! 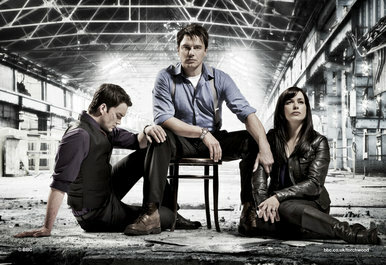 When I began Torchwood: Children of Earth, I couldn't help remembering the time I saw The Ring with a few relatives who to me are just family members, but to strangers could otherwise be called a cop and a marine. For some bizarre reason, although the two are able to walk into buildings at two a.m. in dodgy neighborhoods when alarms are going off, patrol a cemetery, break up a domestic fight, get stationed in Iraq, assemble and disassemble a helicopter-- when a little kid in a film acts in the slightest bit peculiar, they completely freak out. To the point where I remember one informing me that they had to turn all of the lights on in their home after they watched The Sixth Sense and seriously jumped a foot when the boy said "REDRUM" in The Shining-- as soon as not just one but every single child around the globe went postal in Torchwood, I couldn't help but laugh and wonder if this would find the cop and marine hiding for dear life. 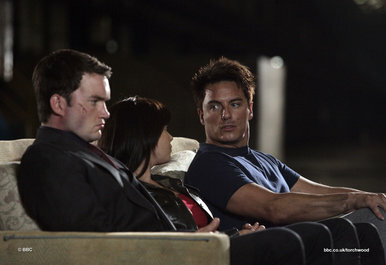 However, the first time Gwen (talented actress Eve Myles) notices the children turning into unresponsive statues in Torchwood's five episode miniseries which comprises its third season, they only do so briefly for a few moments before going right back to normal shortly thereafter. 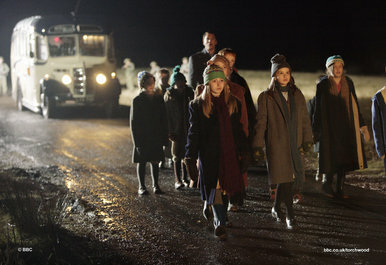 Although when the kids start getting somehow taken over repeatedly throughout the course of five terrifying days and eventually begin speaking in unison the promise that "we are coming," former police officer Gwen (who is now employed at the Cardiff branch of the top secret Torchwood Institute) realizes that the visitors they're warning about are not of this planet. Admittedly, it's a B-movie plot for sure and there's a certain amount of self-conscious cheesiness about the alien hunting group that seem to follow in the footsteps of not just The X-Files but also Joss Whedon's Buffy the Vampire Slayer and Angel. 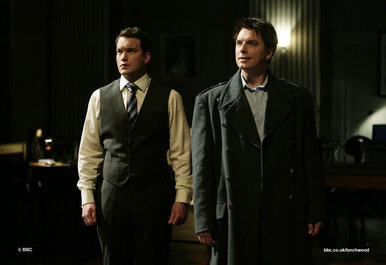 However further research revealed that Torchwood originated from the anagram of the long-running BBC favorite science fiction classic Doctor Who wherein scripts and footage were sometimes labeled Torchwood to try and prevent theft etc. 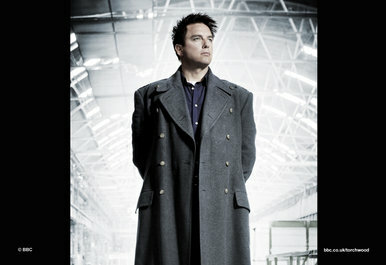 Using that clever coded name for the extra creative kick-start that series developer Russell T. Davies needed when he decided to devise a more modern crime drama/science fiction work-- Doctor Who laid the ground work for the new series by referencing the Torchwood Institute and a few characters before the show took to the airwaves in 2006. Although reviews were mixed, actress Myles and the series itself beat out Who for 2007's Best Drama at the Welsh based BAFTA Cymru Awards. 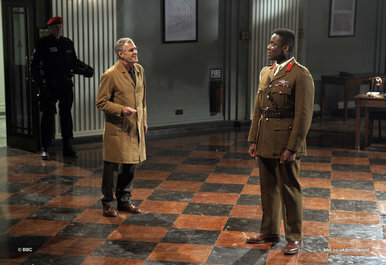 However, despite what seems to have been indications that the show got off to a somewhat rocky start, the second season which was also recently released on Blu-ray and DVD from the BBC received a critical and ratings boost. Additionally, due to the strength of the third series which consisted of the five-part miniseries Children of Earth that premiered in both the UK and the US last month, a fourth season has been secured. 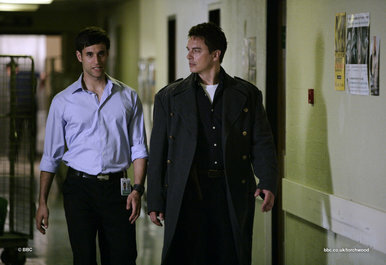 Obviously, when you're dealing with not just one science fiction series but one like Torchwood that was derived from the decades old classic Doctor Who-- both of which I'm unfamiliar with as a viewer-- I was worried that I'd have a hard time just jumping in midstream into a rich mythology of complex characters. However, possibly written and produced with this in mind, Children of Earth which was heavily advertised even here in the states in a way that made one instantly curious why so many kids were suddenly repeating "we are coming" sheds the basic B-movie plot quickly. Therefore the idea of aliens temporarily speaking through children may be the basic set-up but what ultimately evolves is one intense, psychologically powerful, and engrossing work that delivers as a standalone miniseries for those who are unfamiliar with the background of the characters and series. And foolishly I reached for the set before the research which left me with a few unanswered questions as I began growing more and more concerned upon the arrival of a vague alien form called the 456 who threatens mankind. 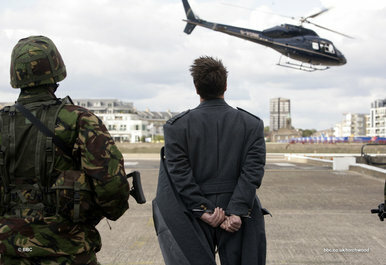 Yet in a way, going in blindly was an ideal approach since it illustrated the power of Torchwood from a storytelling standpoint. Basically, I didn't want to get bogged down in printed words on a page telling me who the mysterious, handsome Captain Jack Harkness was and why he couldn't die or just what exactly Torchwood was in its relationship to the government because its richness was in its mystery, not to mention the fact that within a few episodes, I realized I wanted to see the other seasons only this time in Blu-ray. Like all great science fiction especially in the same 50s and 60s era of B-movies the plot seems to emanate from both creatively and literally as we discover that the 456 had already made an Earthly appearance once before in 1965, Torchwood: Children of Earth is filled with moral, ethical and existential dilemmas and questions that come into play during the final episodes. While given the fact that essentially there's only one major dilemma and just a few subplots, it does feel as though the fifth episode wind-up consists of so much talk and action that the earlier installments had suffered by comparison in their pacing. However, its weaknesses can be easily dismissed by its numerous strengths since it's intelligent, mind-blowing Twilight Zone like TV that makes you ask some insanely difficult questions of how you would act if you were faced with the demands leveled by the 456. Produced for the BBC and greenlit by the same brilliant visionaries who brought Life on Mars to the air during the same time period, once again, the BBC reminds us that they're always there to deliver top-notch programming when our own networks see fit to throw more reality shows our way. 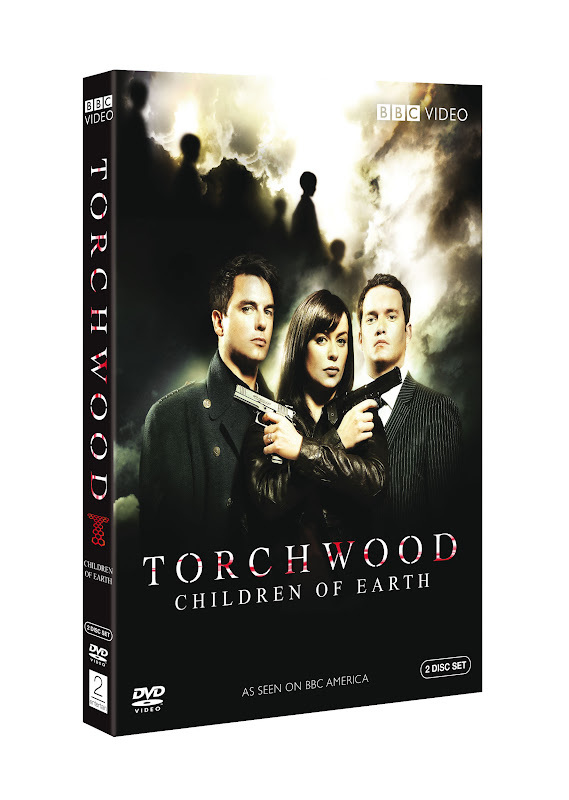 So in the end, even though this one may scare a certain cop and marine I know and it's not for the faint of heart, go ahead and unscramble that anagram and check out Torchwood: Children of Earth for five installments of something that's definitely hard to shake.